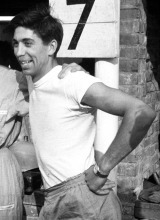 Alan Stacey has to rank as one of the most unlikely racing drivers of all time. When he was 17 he was involved in a motorbike crash and had the lower part of his right leg amputated. Undeterred, he adapted his cars and added a motorbike throttle to the gearlever so he could control the throttle during gear changes. The oddness of the situation was exacerbated by the fact his main mechanic, Bill Bossom, only had one arm. He started racing in a home-built Lotus MkVI, and from that graduated to another kit car - a Lotus Eleven - which he raced at Le Mans under the Team Lotus umbrella. In 1957 he won 16 races and that secured him the first of his Formula One drives in 1958, but he only managed one finish in six starts before his final race at Spa in 1960. On a wretched weekend, Stirling Moss and Mike Taylor had been injured in accidents during practice, and driving the same kind of Lotus as Moss, in the race itself Stacey, who was sixth, lost control of the car and it climbed an embankment before crashing into a field and exploding. He was killed instantly, although witnesses reported they had seen his helmet being struck by a bird moments before it left the track. Five laps earlier Chris Bristow had been killed within a few hundred yards of Stacey's crash, the only time two drivers have died in one race. "In Formula Junior and the Lotus Eleven he was terrific," journalist and friend Jabby Crombac said. "But when it came to Formula One he didn't enjoy the proper throttle control which he needed. That was really his shortcoming. I think the cars were getting too much for him. When he wanted to put the throttle down, he had to shift his hips."